The Diamond roundup begins in a few short hours. The Diamond HMA is situated just to the West of the Triple B Complex and is managed by three BLM districts: Ely, Elko and Battle Mountain. In an unusual move the BLM has not designated one district as “lad” on the operation. The operation is scheduled to start in Ely and run counterclockwise into Elko and finish in Battle Mountain. 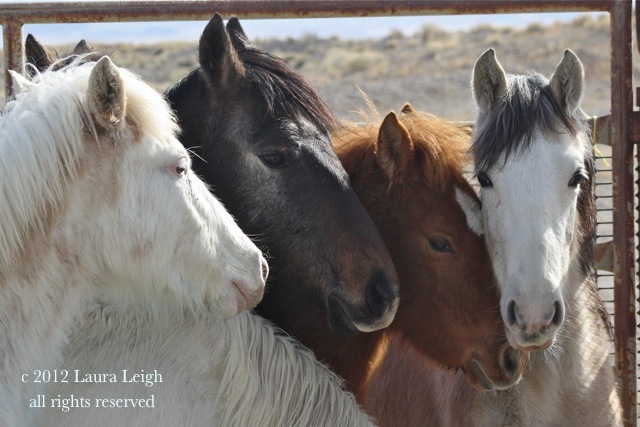 The operation will remove about 603 wild horses out of BLM’s estimated population of 813. This operation is the result of another ten-year plan. The ten year plan gives BLM the authority to remove animals, PZP treat or otherwise “manage” animals without completing a new Environmental Assessment (EA) and allowing the public opportunity to comment. This plan has come into effect as the larger framework for land management, the Resource Management plan (RMP) is underway in the districts. This summer the Diamond (Battle Mountain District) was topic of conversation with the Nevada Department of Agriculture as the district hauled water for wild horses and restricted livestock use during the drought. Boyd Spratling, that serves on the Dept of Ag for the state representing livestock interests and also serves on the BLM’s National Wild Horse and Burro Advisory Board, made a request that the Dept of Ag write to the Secretary of Interior requesting all horses be removed to the lowest possible levels to protect livestock interests. (It is the opinion of WHE that Boyd Spratling has a conflict of Interest and in no way shape or form represents any conversation that makes him an appropriate member of the BLM Advisory Board for wild horses). Wild Horse Education (WHE) was active in drought monitoring this summer and engaged the public in a counter campaign to the assertions made by Spratling. The severe impacts to the range in the area are very real. It is the assessment of WHE that a reevaluation of the impacts of private users must be studied on wild populations. 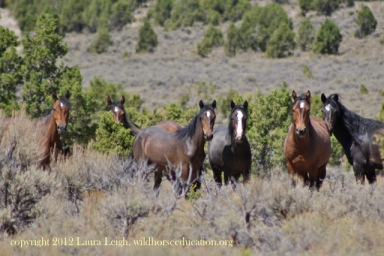 The resource to sustain wild horses within the HMA as a population that shows significant genetic diversity must be preserved as a priority as the range recovers from drought and over grazing by livestock. There is an expectation that there may be some segments of this population that come in stressed simply due to range conditions. We have been told that a policy is in place to ensure that the operation take place at a reasonable pace (no rushing) that takes into account that these compromised segments (at this point identified in areas as the operation moves northward). We were notified that a humane handling policy has been given to the districts and is to be utilized at this operation, even though it has not been finalized into National protocol. We expect to see an announcement coming on the policy next week. The drift fencing is barbed wire at the Diamond and we have been told that segments will be removed prior to any drives in that area. An adoption event is currently planned at the temporary holding location in Battle Mountain for February 2. Confirmation of the event will occur as the operation moves forward and weather and animal health are assessed. WHE will be onsite and posting photos and info on animals for adoption in conjunction with the Battle Mountain district as we did during the Stone Cabin operation of Feb 2012. (note: Successful adoptions of some Stone Cabin yearlings that have been tracked and are doing very well). We will keep you posted as operations move forward on the handling policy and animal health and well-being as the operation moves forward. We do need your help to keep the actions moving toward assuring that we attain an enforceable humane handling policy and sanity in range management… and the access to make it all happen. Help keep us in the field and the courtroom! more info shared the better.keep up the pace…im not talking pacante pace either..alls well that ends well.if wishes were horses,begars would ride..my grandmother always use to say…hmm i wonder what shed think of all this stuff nowadays….i know i want my children.and grand children to enjoy this beautiful wonderful planet so lets keep up the pace.thanks for great wrightings. Seems like just a couple months ago, these bands were obliterated. damn free-loading ranchers ARE STEALING from the horses and the horses. If the horses weren’t cut off from their migration paths, they know where to go in order to survive, they did it for millenia before white man came along. Too bad this roundup wasn’t called off as it looks like there is plenty of snow. Of course the BLM came up with the excuse of range deterioration but nothing about how many cattle are/ were there.